Photo of the day: THE COLD IS SO HARD ON THE KNEES – It was 11°F (-11.67°C) last night in New York City, with wind chills 10-15° degrees colder. To most of us that didn’t matter in our warm beds. Last year the number of homeless people sleeping each night in the New York City shelter system surpassed 50,000+ people for the first time since modern homelessness emerged three decades ago. That grim milestone includes more than 21,000 homeless children. 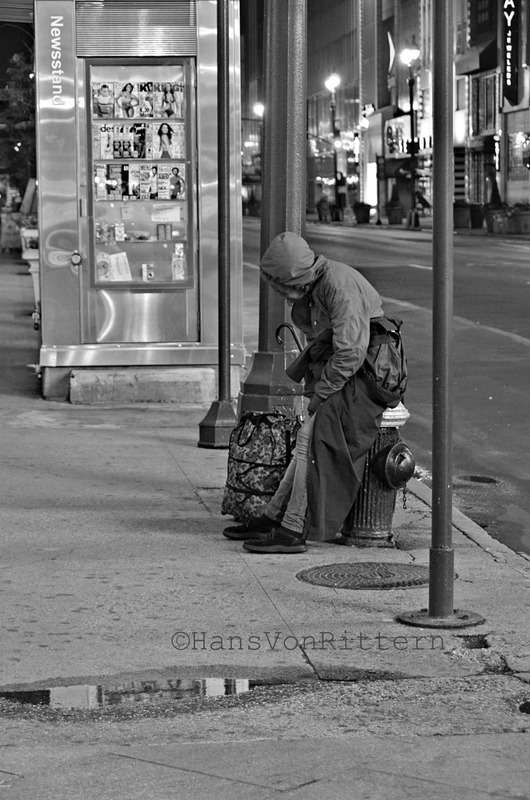 More children and adults are homeless now in New York City than at any time since the Great Depression. Thanks to despicable billionaire mayor Bloomberg New York City’s record homeless shelter population continues to grow at an alarming rate – up 19% percent in the past year alone. And this does not even include the thousands of New Yorkers still displaced by Hurricane Sandy, many of whom comprise extremely low-income households. In total the homeless shelter population under billionaire mayor Bloomberg rose by a staggering 61% percent and the number of homeless families has increased 73% percent. During Mayor Bloomberg’s tenure, New York City homelessness has increased both in absolute numbers and at a higher rate than under previous mayors Koch, Dinkins, or Giuliani. One can only hope our new Mayor DeBlassio and our new administration can rectify these horrific numbers. Please donate to your local charities.